Organizations that fail to translate the requirements of the GDPR into their technology run the risk of operational failure, which can, in turn, lead to reputational and legal damage. Learn how technology plays a key role in an organization’s journey toward GDPR compliance. 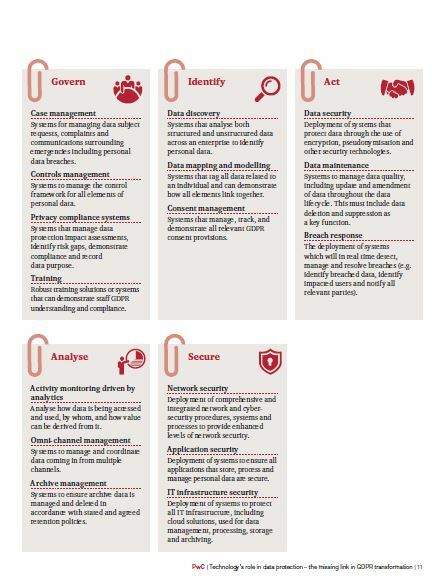 The PwC report outlines what GDPR entails, how it relates to individual businesses, and the steps that can be taken to assessing not only your technology systems and processes but also the data itself. What should organizations do now? DISCLAIMER: This white paper reflects the views of the author and are not necessarily those of Micro Focus, its subsidiaries, or other affiliated companies.